Articles→Z-File→Archive 2015→What’s Up With The Purple Ribbons Downtown? What’s Up With The Purple Ribbons Downtown? 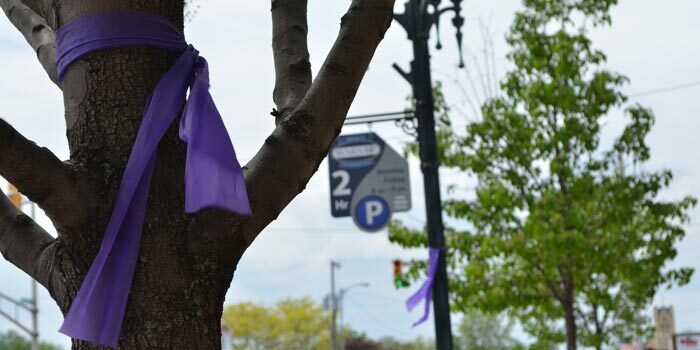 Some of you have been wondering what’s the significance of the purple ribbons tied to the trees and lamp posts around downtown Warsaw. And I’m sure a few of you just know you recognize that shade of purple. Well, here’s the scoop: those ribbons are to raise awareness for the upcoming Relay For Life. The ribbons went up for the most recent First Friday event. The 2015 installment of Relay For Life is just around the corner. The race is set for 3 p.m. Saturday, May 16 and 9 a.m. Sunday, May 17 at the Kosciusko County Fairgrounds in Warsaw. Local supporters and participant can rally to honor cancer survivors, pay tribute to cancer casualties, and raise money to help fight cancer. Not to mention, enjoy some food, fun and fellowship. To sign-up, donate or to get more information, visit www.relayforlife.org/kosciuskocountyin.